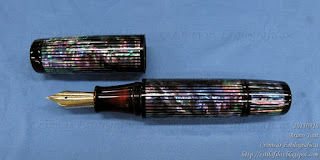 Mr. Iwase is a pen aficionado who likes to decorate his pens with sea shells; that is, with raden. At the last meeting of the Wagner group in Tokyo he brought a couple of superb examples of his hobby. 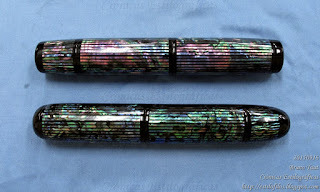 The raden decorated pens based upon Momose's creations. The filling system follows the Japanese eyedropper scheme (shut-off valve manned from the tail). 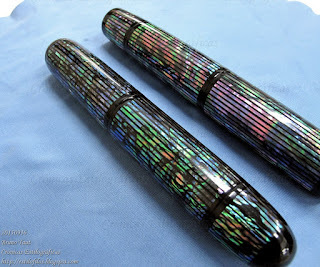 The bases, in this case, are two ebonite pens made by Mr. Momose (lathe work) and Mr. Kubo (nib)—in fact a winning combination desired by many a stylophile in Japan. And then, the decoration. It is particular brilliant—note how the different stripes of raden preserve the colorful pattern of the shell. The superb work of Mr Iwase is clearly visible on this pic. Note how the decoration preserves the color pattern of the original shell. The nib by nibmeister Kubo Kohei. The engraving reads "Kubo / MIKADO / K18 750 / MADE IN JAPAN". The section is decorated with urushi resin, therefore the reddish color. These works by Mr. Iwase are unique pens—one of a kind. They do not appear in any catalog or book. These lines might, in fact, be one of the few records ever made public about them. And their relevance in the history of Japanese pens is merely anecdotal. But those pens are real, and their maki-e, outstanding. The cap top is decorated with three circles meaning, according to the author, the three persons involved on the pen: Iwase, Kubo and Momose. 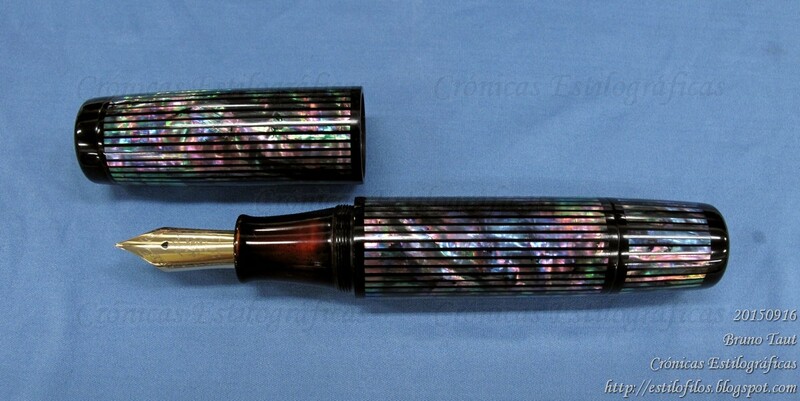 It is hard not to compare Mr. Iwase’s pen to that made by Zôhiko also with raden decoration. The later, let us remember, shared a similar base pen, and is valued in JPY 1200000. But this pen lacked a real nibmester’s nib, and some seriously doubt it performed as a pen. 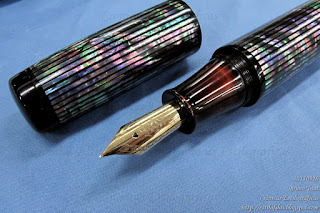 Iwase’s creation is more interesting—better decoration, better nib. My thanks to Mr. and Ms. Iwase. Pilot Custom 823 – Montblanc White Forest. Incredible raden work! 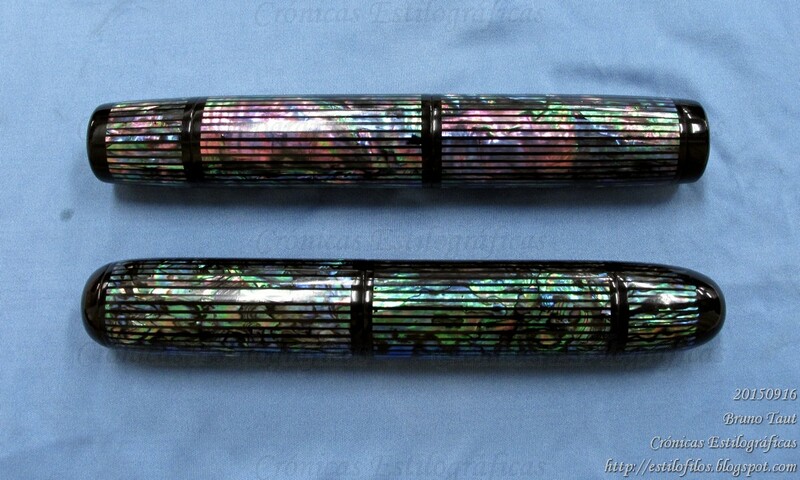 Thank you so much for showing us these remarkable pens. I know about Mr. Kubo and Mr. Momose but I didn't know of Mr. Iwase. WOW! Understated, elegant and it lets the natural colours of the shell shine. Are there any close-up pictures of the nib? Overwhelming. What a piece of work, indeed. I believe this should be bespoken, isn't it? Thanks for sharing. Once again, a(nother) beautiful, and functioning, pen. And another find from pen makers who are not household names. Excellent journalism. These two pens are not exactly bespoke. 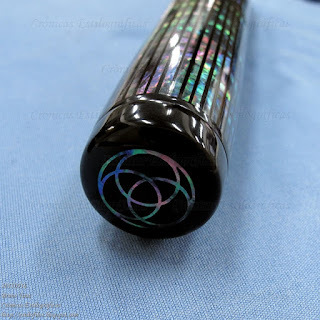 Mr. Iwase ordered them to Mr. Momose and Mr. Kubo, and then he decorated them by adding raden and urushi to the plain ebonite. Mr. Kubo, Razi Syed, was in charge of the Danitrio big nibs in 24 K gold. Since the publication of this text I have got some pic of the nib and will add it to the text promptly. Some examples of Kubo Kohei's work have already shown up on these Chronicles.